PHUKET: A 22-year-old man died after the motorbike he was riding slammed into the back of a bus parked by the side of the road on the main road to the airport early this morning (Feb 19). Lt Col Suphon Muangkai of the Thalang Police was informed of the accident at 5:15am. 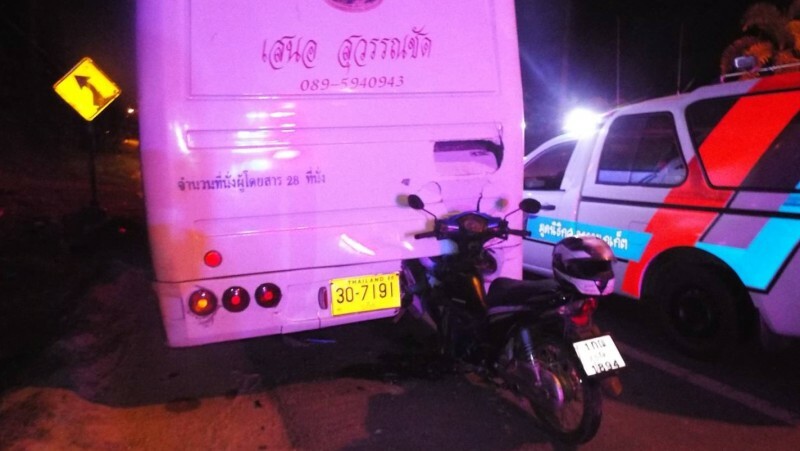 Arriving at the scene with rescue workers, police found the white bus, with Saner Suwannachote emblazoned on its rear, parked by the side of the airport road (Route 4026) near the Thalang Technical College. A black Honda Wave motorbike was still upright pinned into the back of the bus. On the ground beside it was the body of Rittichai Towkong, 22, of Moo 8, Thepkrasattri. Of note, Mr Rittichai’s safety helmet was still fitted to the back of the bike for carrying while not wearing it. The bus driver had fled the scene, but police found on the ground nearby a small bag containing the ID card for Adun Pitchanan, 60, from Tambon Tha Kham, in Palian, Trang. Mr Adun presented himself at Thalang Police Station this morning, Col Suphon later confirmed to The Phuket News. Mr Adun explained that he parked the bus by the side of the road to sleep while waiting to pick up passengers at Phuket International Airport. He told police that he was asleep in the bus when a loud noise woke him. He exited the bus and saw Mr Rittichai on the ground, apparently already dead. Fearful, he fled the scene. Col Suphon noted that Mr Rittichai was an airplane maintenance staffer on his way to work at Phuket International Airport. At this stage, police believe that Mr Rittichai was travelling at high speed and was unable to avoid hitting the bus after coming around a curve. However, he added that officers had yet to conclude their investigation before deciding on whether to press any charges for the accident. What is the minimum distance a car, truck, bus is allowed to park before/after a curve? Why are such "small" vehicles, a bus, allowed to park, on the road, no wonder people drive into them. ... Fearful, the driver of the parked bus fled the scene...leaving a bag with all his identifying matters. What is that in Thailand, much of the time to fled the scene? Actually by law punishable. What are thai people afraid of in such situations? Bad ghosts or so?